Washing machines are the workhorses of the household appliance stable, and when they go down, they&apos;re the toughest to get by without. Who wants to drag their laundry down the street to the Laundromat? This safety feature keeps the washer tub from agitating or spinning as long as the lid remains open. The lid switch is normally located beneath the main top and is in series with the motor circuit and must be activated for the motor to operate. When the lid is closed a pin pushes against the lid switch lever and closes the switch, if your washer does not agitate and the motor is not getting any power. See if the lid switch clicks when closing the washer door. If not, the switch may be faulty. Leaking water from a washing machine usually comes from hoses or connections. Be sure that water appearing to be a leak isn’t drain water from a backed-up standpipe. Check the fittings where the hoses connect to the faucets and to the back of the washing machine. Also look for worn or leaky hoses. Determine whether the machine is over-swinging, which can cause it to overflow. If your washer isn’t draining, the problem could be drainage hoses or drain pump filter housing blocked or clogged. Clogging can result from clothes getting stuck. If your washer is not draining properly, check the drainage hoses for obstructions. If your washer is not filling properly, examine the incoming water hose for twists and bends. When the washer drains and fills at the same time, the drainage hose position is too low. This causes a problem called siphoning. This can be corrected by repositioning the drainage hose above the water level and making sure that the hose is not pushed too far into the standpipe. 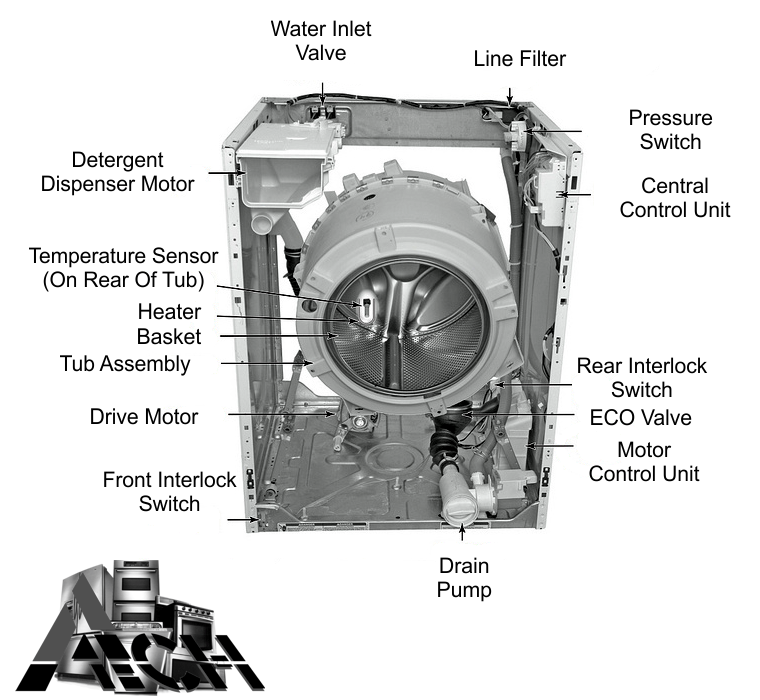 Some top load washers use a direct drive motor coupling to transfer power from the motor to the transmission. The drive coupling connects the motor to the transmission and consists of 2 plastic drive forks with a rubber coupling between them. One of the drive forks is attached to the drive motor shaft and the other is attached to the transmission input shaft. As the motor shaft rotates, the rubber coupling between the drive forks absorbs the torque to prevent the forks from breaking. Normal use will create wear on the coupling and eventually the drive forks may slip and not engage. The problem with your washer can be difficult to pinpoint without a clear indication of a specific defective component. Call us today for a same-day examination!